I am living in the center of Germany together with Peter, my husband on a 42000 m2 area. We are members of WSA (World Sled Dog Association) which is member of IFSS. For most European mushers, racing in North America and specially the Yukon Quest is a dream, and so it is for me as well. The Quest will be my first long distance race. My goal is to make it to Whitehorse with a healthy team. In Europe it is hard to find good training conditions for long distance racing. Also there is now big competition for long distance. I love to be part of a fast running team going high speed. That's the reason for me to do sprint races since 1989. After some rig races I started with a 6-dog team winter 1990 in Austria. After 2 weeks training camp on snow, with a hell of problems, the first race came near by and I wasn't sure whether or not I was ready. But once the race started, all my doubts were gone and the dogs did a great job. We operate a Siberian Husky kennel of about 40 dogs on a yearly average. They are kenneled in groups of 4-6 dogs and when I am inside the yard, they all are together on a 15000 m2 playground. Females with puppies are separated for the first 6-8 weeks in kennels outside the playground. All other kennels are inside. As the weather is completely different where we are living (lots of rain and wind during spring and autumn), keeping dog houses dry and free from wind is important to keep the dogs healthy. Our feeding program is based on dry food supplied by Bewital, a German based producer serving all over Europe. We are adding pork fat, chicken meal and egg powder during winter. Together with Bewital we have developed a high performance supplement which we will try as well in the Quest. I am convinced that you need good dogs, good food, a lot of training in connection with excellent equipment (to make dogs feeling well) to have success. But the most important is the feeling for the dogs, to understand them, to get everything out of them and make them happy. Believing in them will make them returning all the efforts you've done and have fun with them. I am working with Siberian Huskies which I get by chance. Me and Peter were looking for a dog in 1985 and one day, a friend of ours placed a puppy on the table in front of me. I fell in love with Siberians and one week later we got ours. Years are gone and now we own between 35-45 dogs. Some years ago we believed in pedigrees and nice bodies. Today I am sure that the most important part of a dog is between their ears. The physical attributes are important for a good dog, but if it is an excellent one depends on the desire to go. My favorite dog, "Bugs," is such a dog. He becomes 9 years this April and still loves to race. Having Bugs in lead I never lost a race. He is really that dog every musher is looking for. Apart from his sports career, he is the producer of most of our dogs. I will miss him the next years. Since I left looking for pedigrees, we are breeding "the best with the best." We have and will never breed with dogs not making my team. As we keep most of our puppies until getting in harness, we assure that we won't sell them until tested. Those which we wouldn't keep for our own teams, we'll never sell to mushers but to families not working them as mushers would. Depending on the season, puppies get in harness between 6-10 months. In the first runs, I am just letting them run as they like. Mostly the good ones do it from the beginning if they haven't done anything else before. Our youngsters mostly run in smaller teams the first year. Last year I was lucky--four sons of bugs made it as yearlings, one of them in lead, all in my first team. Never over train them but get them used to distance. Keep them under race conditions during training period and also when resting in summer. As more routine as more time for each dog. Once a dog most be loaded, it will be loaded again and again. Find out the limits during training but never in a race. Believe in your dogs. It is never the dog but the musher doing mistakes. Whatever you do to your dogs, they will return in double. I never let them go full speed in training. The first time they are allowed to go full speed is the first sled race in a season..
Based on the most important event, my race schedule is planned. No competition, no race. My strength is that I concentrate on my team. Well, I hope it is reached end of Feb. in Whitehorse. After that I might think about new challenges, but right now I am concentrating on the Quest. Put a strong and happy team of dogs together, concentrate on your team and not on your competitors, believe in both your dogs and yourself and you will make it. That sled dog sports become Olympic. Each individual can support with fair competition, supporting the media, spreading knowledge to newcomers. But the most important is being good to their dogs and treating them well. Clubs and organizations, especially their officials, play a key role in developing our sport. They have to manage clubs and organizations as business companies and not as hobby sports clubs. They have to be business partners to sponsors and media and act as such. A vision is needed and a concentration of power to compete with other "in sports." 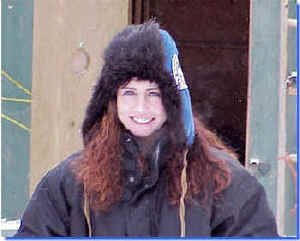 A beginning musher should listen to the best mushers and not the one nearest to her/his home. Listen to all of them and make up your minds yourself. The real good mushers will share their knowledge. Andermatt, Switzerland, February 1994, European Championship. The first and only time I didn't believe in Bugs. I didn't run him lead and lost the game. It was an excellent lesson. Nothing can beat standing behind a fast running sled dog team and cold weather conditions.